We encourage all person over the age of eighteen to enjoy the Site and we do not discriminate on the basis of age, race, national origin, gender, sexual orientation or religion. No person under the age of 18 should use the Website. We strongly encourage all parents and guardians to monitor the Internet use of their children. Use of the Website by any user shall be deemed to be a representation that the user is 18 years of age or older. All purchases from SuperJeweler.com come with SuperJeweler.com's Enduring Quality Guarantee. 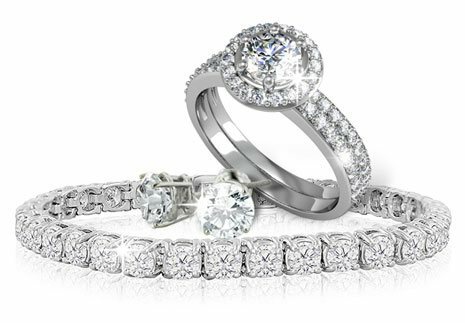 Your SuperJeweler.com jewelry purchase includes a lifetime warranty against the loss of side stones or damage to the jewelry's setting or center stone. It also includes a one-year replacement guarantee against the loss of your jewelry's center stone. If you ever lose a side stone from your jewelry, SuperJeweler.com will replace that side stone with a stone of similar quality. If your setting is ever damaged, SuperJeweler.com will repair or replace the setting or center stone, at its sole discretion, at no cost to you. If you lose a side stone or your setting is damaged, you must send the piece back to SuperJeweler.com, along with your original purchase receipt or, if you are unable to provide the original purchase receipt, include the name of the original purchaser and the approximate date of purchase. If your center stone is lost from its original setting within one (1) year of purchase, SuperJeweler.com will replace the stone. If your center stone is ever chipped or broken, in its original setting, SuperJeweler.com will replace the stone with one equal in quality and value to your original stone. If you lose your center stone within one (1) year of purchase, or if your center stone is ever chipped or broken, you must send the piece back to SuperJeweler.com, along with your original purchase receipt. Shipping details are listed below. This warranty does not cover damage to jewelry other than that incurred in normal wear. This warranty does not cover lost jewelry. You must provide identifiable pieces of the jewelry in order for SuperJeweler.com to honor this warranty. If SuperJeweler.com determines that it did not manufacture the original piece it is under no obligation to honor this warranty. Improper repair or service performed by a third party other than SuperJeweler.com will void this warranty. This warranty is non-transferrable. All warranty claims under the SuperJeweler.com Enduring Quality Guarantee must be made by the original purchaser or the original gift recipient. This warranty does not cover losses or damage by any successor owner of the jewelry, including but not limited second-hand purchasers, heirs or assigns. This warranty does not cover damage to jewelry other than that incurred in normal wear. This warranty does not cover lost jewelry. We make every attempt to avoid errors in pricing and product information, but we are human. If a mistake does occur, we reserve the right to correct it, and we apologize for any inconvenience it may cause.Further to this, we reserve the right to cancel any order, particularly if you seek to take unfair advantage of a system error or programming problem. This right is solely upon our determination. All prices listed on this site are in U.S. dollars. SuperJeweler.com has a 60-day money back guarantee policy. This is a simple process and is described fully in our 60-day money back guarantee. To see the complete list of procedures for returning merchandise please visit the SuperJeweler.com FAQs section of this website, reachable from the Website's homepage. Please send your jewelry, along with the required proof of purchase, to 7 W. 45th St., 10th Floor, New York, New York, 10036. You are responsible for the costs associated with shipping and insuring your jewelry for shipment back to SuperJeweler.com. Upon replacement of a stone or upon repair or replacement of the setting SuperJeweler.com will ship the piece back to you and will cover all costs associated with shipping and insuring the piece. We understand that you want to get your order a quickly as possible, but unfortunately sometimes there is a delay caused by the carrier used to deliver products. Because of this we have a 15-business-day waiting period before any product will be resent. We have attempted to accurately depict the colors of the products offered on this site. Because the color you see is dependent on your computer monitor we cannot guarantee that the color you see will be accurate. The products also may appear larger or smaller than their actual size depending on your monitor. Some photographs have been enlarged to show detail. If you are not satisfied that with your purchase, all jewelry comes with a 60-day money back guarantee detailed below. The stones and metal have been graded for quality and listed on the Website according to industry standards. Aside from the right to return jewelry under the 60-day money back guarantee, SuperJeweler.com is not liable for any actual or consequential damages associated with the grading of stones or gold offered on the Website. We are in the business of selling products to the persons that will use them. If you plan to resell our products please give us a call. Since this is a retail website we require that the customer agree that they will not engage in the business of reselling components purchased from SuperJeweler.com, or remove components from product for resale, except upon express prior written authorization of SuperJeweler.com. Any resale of product or components will void all guarantees and warranties. SuperJeweler.com occasionally offers products from third party vendors. SuperJeweler.com is unable to guarantee karatage/stone weights on such products. When you make your first purchase on the Website, you will be asked to create an account. By creating an account, the system will remember your personal and purchase information and the checkout process on future purchases will be fast, easy and always completely secure. We request information from the user on our order form when making a purchase. Here is what a user must provide: 1) their contact information, like name and shipping address, and 2) financial information, like credit card number and expiration date. This information is used for billing purposes and to fill the customer's order. If we have difficulty processing an order, this contact information is used to communicate with the customer. If a user's personally identifiable information changes (such as your zip code, phone, e-mail or postal address), or if a user no longer desires our service, we provide a way to correct, update or delete/deactivate that user's personally identifiable information provided to us. If a user wishes to subscribe to our catalog, newsletter, etc., we ask for contact information such as name, street address and e-mail address to provide these communications. Because we respect our users' privacy, we provide a way to opt-out of these communications. Please see the choice and opt-out section below. On rare occasions it is necessary to send out a strictly service related announcement. For instance, if our service is temporarily suspended for maintenance we might send you an e-mail. Generally, users may not opt-out of these communications, though you can deactivate your account. However, these communications are not promotional in nature. Established members will occasionally receive information on products, services, special offers and a newsletter by e-mail. Out of respect for the privacy of our users, we present the option to not receive these types of communications. Please see our choice and opt-out below. Please be aware that we may provide links to third party websites from this website as a service to our users and we are not responsible for the content or information collection practices of those sites. We have no ability to control the privacy and data collection practices of such sites and the privacy policies of such sites may differ from that of SuperJeweler.com. Therefore, we encourage you to review and understand the privacy policies of such sites before providing them with any information. SuperJeweler.com assumes no liability for any damages you may suffer from visiting such linked websites, including without limitation, damages caused by computer viruses, Trojan Horses or other destructive/disruptive code which may be downloaded from such linked websites. Any links contained on this website shall not be construed as an endorsement by SuperJeweler.com of any such linked website. SuperJeweler.com has not reviewed or researched the full content on these linked websites and shall not be held responsible should you encounter any materials that may appear inaccurate, indecent or illegal. If you visit such a website that is linked to this website, please contact us and we will determine if the link should be removed from the Website. For some products that we offer we have teamed up with leading companies to bring you quality services and products. Our reference to them as an Advertising Partner does not mean that we are partners with these companies in the legal sense, merely that we are working with them to offer products and services to you. All companies that we feature on our site are solely responsible for their own obligations to you and while we are not legally responsible for their obligations, be assured that we will always assist you in dealing with them should any issues arise. SuperJeweler.com actively markets its products through affiliate campaigns and, from time to time, offers coupons through such affiliates. Offers through affiliates may vary. SuperJeweler.com also does last-click-attribution in order to properly compensate its affiliate marketers. Winners of any contests or giveaways on the Website agree to provide SuperJeweler.com with a photograph of themselves for publicity purposes, to be posted on the Website or on various social media websites. SuperJeweler.com will not publish winners' full names; only the first name to protect winners' privacy. Failure by a winner of a contest or giveaway to provide a photograph of themselves may result in the forfeiture of any prize won. Prices on the website do not include sales tax or any other customs duties, use, value added, excise, federal, state, local or other taxes. New York residents will be charged sales tax, but all other such duties or taxes shall be paid by you, or, in lieu thereof, customer shall provide us with an appropriate tax exemption certificate. This Website and all materials on the Website, including, but not limited to the sales copy, navigational aids, images, illustrations, and logos are either our or our affiliates' and licencors' property and are protected from unauthorized copying and distribution by copyright law, trademark law, international conventions and other intellectual property laws. If you desire to use these properties, you must obtain our written consent prior to your use. In no event shall we be liable for any indirect, special, incidental or consequential damages. Customer may not assign its rights or obligations hereunder without the express prior written consent of SuperJeweler.com . These terms and conditions constitute the entire agreement between SuperJeweler.com and the customer regarding any sale. These terms expressly supersede and replace any prior or contemporaneous agreements, whether written or oral, relating to said sale, including any terms and conditions on any of customer's documents or purchase orders. ANY ADDITIONAL, DIFFERENT OR CONFLICTING TERMS AND CONDITIONS ON ANY SUCH DOCUMENT ISSUED BY CUSTOMER AT ANY TIME ARE HEREBY OBJECTED TO BY SUPERJEWELER.COM, AND ANY SUCH DOCUMENT SHALL BE WHOLLY INAPPLICABLE TO ANY SALE MADE HEREUNDER AND SHALL NOT BE BINDING IN ANY WAY ON SUPERJEWELER.COM. This agreement shall be binding upon the heirs, successors and assigns of the parties hereto. If any provision of this agreement shall be held to be invalid or unenforceable, the remainder of this agreement shall remain in full force and effect. SuperJeweler.com's database tracks the traffic throughout our site. This information is used to compile overall statistics and is not recorded at an individual level. This includes IP (internet protocol) addresses, browser type, ISP (internet service provider), referring/exit pages, platform type, date/time stamp, and number of clicks to analyze trends, administer the site, track user's movement in the aggregate. The statistics help us decide which products and services best serve our members and guests. SuperJeweler.com uses aggregate information from demographic surveys, traffic patterns and IP addresses to customize our site. Aggregate information is occasionally shared with partners third parties for purposes such as planning or executing advertising or promotions. We do not share any personally identifiable information. SuperJeweler.com gives you access to third party partners to provide you with certain services that are detailed below. SuperJeweler.com will provide that third party with your transaction information and then that third party will collect additional information if needed to provide you with the requested service, such as outside shipping company to ship orders, and a credit card processing company to bill users for goods and services. In order for SuperJeweler.com to properly fulfill its obligation to our customers, it is necessary for us to supplement the information we receive with information from third party sources such as our affiliated websites. For example, in order for SuperJeweler.com to enhance our ability to tailor the site to an individual's preference, we combine information about the purchasing habits of users with similar information from our affiliated sites and SuperJeweler.com. When a user makes a purchase from any of these companies, the companies collect and share that purchase information with us so we can tailor the site to our users' preferences. In its pursuit of constantly offering new and innovative products, SuperJeweler.com may, at some point in the future offer products other than Jewelry, and may offer such products through websites other than the Website. Any and all information you provide to SuperJeweler.com may be shared with such other affiliated businesses. SuperJeweler.com takes every precaution to protect our users' information. When users submit sensitive information via our website, your information is protected both online and off-line. When our registration/order form asks users to enter sensitive information (such as credit card number and/or social security number), that information is encrypted and is protected with the best encryption software in the industry - Secure Socket Layers (SSLs). While on a secure page, such as our order form, a lock icon appears on the bottom of your Web browser. When you are not on a secure page, no lock icon will appear. In addition, the servers that we store personally identifiable information on are kept in a secure environment under restricted access. If you have any questions about the security of our website, send us an e-mail at sales@superjeweler.com for more info. Natural black diamonds extremely rare. SuperJeweler sells only heat treated black diamonds, treated with the High Pressure Heat Treatment (HPHT) method. In HPHT treatment, white included poor quality diamonds are heated to approximately 1260 degrees Fahrenheit, in a reducing atmosphere, meaning under the conditions of very little oxygen, and the unpleasant white and included diamonds become black. HPHT treatment is completely safe, and produces gem quality black diamonds. Natural untreated blue diamonds do exist, such as the Hope Diamond, they are extraordinarily rare and very expensive. SuperJeweler's blue diamonds are safely irradiated in a cyclotron or linear accelerator, followed by a heat treatment, that turns brownish and pale yellow diamonds into richly colored, affordable blue diamonds. This color change to blue is permanent, but can change if the diamond is exposed to high heat. SuperJeweler's blue diamonds are beautiful and safe to wear. Ruby, a member of the corundum family of gemstones, is generally red in color, from light pink to dark red. The most common treatment for the enhancement of color is heat treating. In the heat treating process, rough un-cut rubies are heated to 1700-1800 degrees celsius, which improves both color and clarity. All rubies that SuperJeweler sells are heat treated for the enhancement of red color and clarity. Some items contains a lab-created ruby, created with the Flame Fusion method. Flame Fusion lab-created synthetic rubies are a beautiful red color and have excellent clarity, and are very affordable. Lab-created rubies have the same properties as natural rubies, but are man-made in a laboratory. Sapphire, a member of the corundum family of gemstones, is generally blue in color, from cornflower blue Ceylon sapphires, to dark blue Australian sapphires, to bright royal blue Burmese sapphires, and everything in between. The most common treatment for the enhancement of color is heat treating. In the heat treating process, rough un-cut sapphires are heated to 1700-1800 degrees Celsius, which improves both color and clarity. All sapphires that SuperJeweler sells are heat treated for the enhancement of blue color and clarity. Some items contains a lab-created sapphire, created with the Flame Fusion method. Flame Fusion lab-created synthetic sapphires are a beautiful blue color and have excellent clarity, and are very affordable. Lab-created sapphires have the same properties as natural sapphires, but are man-made in a laboratory. Emerald, a member of the beryl family of gemstones, is generally green in color, famously the deep emerald green of Columbian emeralds, but available from light pea green to dark green with black gardening. Inclusions in emeralds are referred to as garden. The most common treatment for the enhancement of color is oiling. In the standard oiling process, emeralds are immersed in colorless oil or resin, inside a vacuum chamber to gain better penetration into the stone. Newer treatments go further, with the introduction of green colored oils and hard epoxy resin to improve color and clarity. All emeralds that SuperJeweler sells are oiled for the enhancement of green color and clarity. Some emeralds that SuperJeweler sells have resins introduced to improve clarity. Some item contains a lab-created emerald, created with the Flux Fusion or Hydrothermal method. Flux Fusion and Hydrothermal lab-created synthetic emeralds are beautiful in color and have excellent clarity, and are very affordable. Lab-created emeralds have the same properties as natural emeralds, but are man-made in a laboratory. Some items contains a lab-created pink sapphire, created with the Flame Fusion method. Flame Fusion lab-created synthetic pink sapphires are a beautiful pink color and have excellent clarity, and are very affordable. Lab- created pink sapphires have the same properties as natural pink sapphires, but are man-made in a laboratory. Tanzanite is part of the zoisite group of gemstones. One of the most recent gemstones discovered, tanzanite was discovered in Tanzania in 1967. The most popular color is a pretty blue, with a purplish hue. Tanzanites are heat treated to a temperature of 400-500 degrees Celsius, which eliminates brownish and yellowish tints. All tanzanites that SuperJeweler sells are heat treated to enhance the blue color. Blue topaz is a member of the topaz gemstone family. While blue topaz occurs naturally, most blue topaz on the market today is made from white topaz that is irradiated to become a blue color. This process produces a gemstone that is from sky blue to dark blue in color, sometimes showing a greenish blue, and is not harmful to wear. All blue topaz that SuperJeweler sells is irradiated. Pink topaz is made from white topaz that is coated pink by using the vapor deposition method, patented by Azotic Coating Technologies. While the pink coating on pink topaz is durable, exposing the gemstone to intense heat can cause the color to fade. All pink topaz sold by SuperJeweler is enhanced with the vapor deposition method. Mystic topaz is made from white topaz that is coated greenish purplish color by using the vapor deposition method, patented by Azotic Coating Technologies. While the greenish purplish coating on mystic topaz is durable, exposing the gemstone to intense heat or buffing by a jeweler can cause the color to fade or peel. All mystic topaz sold by SuperJeweler is enhanced with the vapor deposition method. Amethyst is a member of the quartz family. Amethyst sold by SuperJeweler is natural and not treated. Green amethyst is a member of the quartz family. Green amethyst sold by SuperJeweler is made from natural purple amethyst that is heat treated and turns a pretty green color. All green amethyst sold by SuperJeweler is heat treated. Lemon Quartz is a member of the quartz family. Lemon Quartz sold by SuperJeweler is made from natural yellow quartz that is irradiated with gamma radiation, and turns a pretty yellow color. Gamma radiation treatment of gemstones is harmless to people, and there is no cooling period needed. This is the same type of radiation that is used to sterilized foods. All lemon quartz sold by SuperJeweler is irradiated. Garnet sold by SuperJeweler is natural and not treated. Citrine is a member of the quartz family. Citrine sold by SuperJeweler is made from natural amethyst that is heat treated and turns a pretty yellow color. All citrine sold by SuperJeweler is heat treated. Aquamarine is a member of the beryl family. Most aquamarines are heat treated at 400-450 degrees Celsius to enhance the stone to the popular blue-green color. All aquamarines sold by SuperJeweler are heat treated. All pearls sold by SuperJeweler are freshwater cultured and produced in China. Opals are generally white in color with colorful rainbow hues. Common treatments are impregnation with oil, resin, or plastic. All opals SuperJeweler sells are all enhanced and impregnated with oil and/or resin. Peridot is a member of the forsterite-fayalite mineral series. There are no know enhancements of peridot to improve its color or clarity. SuperJeweler sells natural, untreated peridot.